Smart Caller ID for your iPhone! Find out the name of the phone number calling! No more guessing at who's calling - even looks up wireless callers!*. 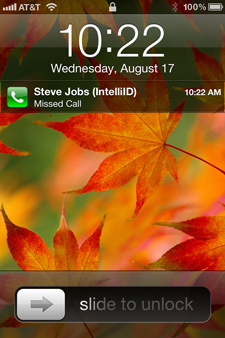 IntelliID fetches the caller's name from a US/Canada calling database and displays on the incoming call screen, as well as missed calls on the lock screen and on the Recent call list. 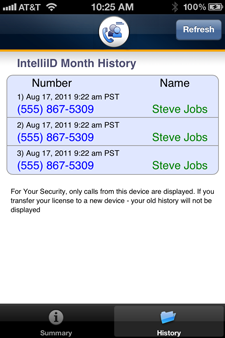 IntelliID also makes it simple to add contact numbers after they've called by filling in their first and last name when you add an IntelliID'd new contact. Supports iOS 4.x and iOS 5.x. Free Trial - Install now for 2 Free Lookups! - Integrates into Missed Call information in Recent Phone list and on lockscreen for iOS 4.x and iOS 5.x! CallerID on Incoming Calls CallerID finally on the iPhone! First and only integrated CallerID. Lookup who's calling when a call is coming in! 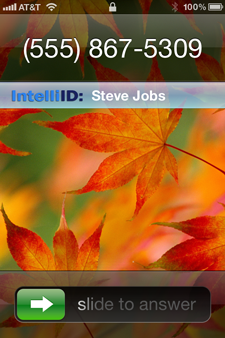 First and only integrated CallerID for the iPhone! 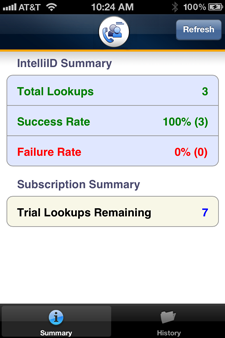 Keep track of your usage View success/failure rate summary and your subscription information in realtime. Lookup History Keep track of your usage in realtime. How To Install: Jailbreak your iDevice and purchase/install via Cydia. Click Here for details. Intelliborn, IntelliDial, IntelliScreen, IntelliScreenX, IntelliID, MyProfiles, MyWi, My3G, Elert, Messages+, and Tlert are Trademarks of Intelliborn Corporation. Intelliborn Corporation is not affiliated with, endorsed by, or sponsored by Apple, Inc. Apple®, the Apple logo, iPhone®, the iPhone logo, iPhone 3G®, the iPhone 3G logo, iPhone 3GS®, the iPhone 3GS logo, iPod Touch, the iPod Touch logo, iPad®, the iPad logo, iPhone 4®, the iPhone 4 logo, iPhone 4S®, the iPhone 4S logo, and iTunes® are trademarks of Apple Inc., registered in the U.S. and other countries and are being used without permission.